The JATC has formulated a rigorous 5 year apprenticeship training program that leads to building trades journeyman, a professional craftsman who meets the needs of our signatory contractors and clients. Must be at least 18 years of age. Picture ID required. High school graduate or adequate proof of or equivalent educational attainment. Must be a resident of Columbiana, Mahoning or Trumbull County. Personal interview by the committee. Applicants selected for our program will be required to take a physical examination and drug test by a physician approved by the Joint Apprenticeship Committee. 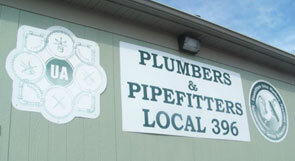 These courses are also offered to any current Local 396 member who wishes to upgrade his/her skills. Our goal is to provide our signatory contractors with highly trained and efficient mechanics who can get the job done in a timely manner and under budget. The brothers and sisters working in Local 396 jurisdiction are proud to know they are making a good living and are able to support their families and contribute back to the local community in which they live.